Get going with the PADI Diver Propulsion Vehicle Specialty Instructor Course! 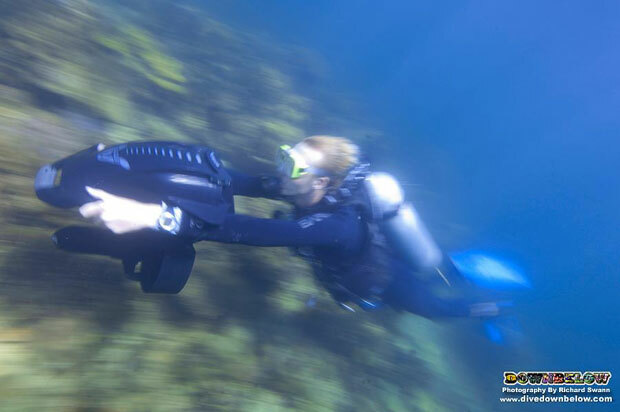 Home/News/Get going with the PADI Diver Propulsion Vehicle Specialty Instructor Course! The PADI Diver Propulsion Vehicle (DPV) Specialty Instructor course is very popular with James Bond wannabes! Who doesn’t want to be like James Bond though? As part of the PADI Master Scuba Diver Trainer (MSDT) course, the PADI DPV Specialty Instructor course is awesome fun for divers! It’s practical too, of course! At our premier PADI 5 Star IDC Dive Centre, resident Platinum PADI Course Director Richard Swann conducts the MSDT course. His students must organise all logistic aspects for the training dives and they will role-play between them as part of a team. Acting in their Instructor role, the Go PRO candidate must assess their students’ handling of the DPV, avoiding any hazards related to the DPV and avoid damaging the fragile coral reefs. Some of Richard’s students are members of our full time PADI Instructor staff team who are ready to progress their scuba diving career to new heights for their personal and professional development! Continuing scuba diving education on an Instructor-level is so enjoyable, just as it is for the recreational diver! Contact one of our Head Office staff for further details on our Go PRO internship packages that we offer! You won’t regret continuing your dive education because it will help you live your diving dream better! By Joanne Swann|2014-02-24T11:07:10+08:00February 23rd, 2014|News|Comments Off on Get going with the PADI Diver Propulsion Vehicle Specialty Instructor Course!